Chicago | Reuters – U.S. live cattle futures fell Friday for a third straight session, with the benchmark CME October contract notching a six-week low on disappointing cash cattle values, traders said. Slaughter-ready cattle traded Thursday at $109 per cwt in Texas and Kansas, down from $109 to $110.50 last week. Some traders had been anticipating a stronger cash trade in light of firm prices for wholesale beef. “With the boxed beef prices being higher most of the week, I thought for sure the cash (cattle) market would be steady at worst,” one trader said. CME August live cattle futures ended down 1.700 cents at 106.250 cents per pound. The most-active October live cattle contract fell 2.025 cents to 102.700 cents. 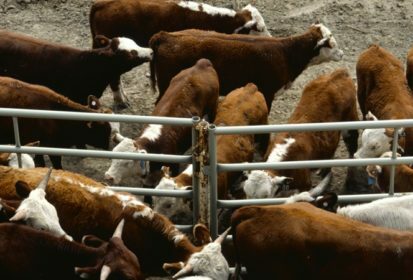 Lightly traded CME August feeder cattle futures rose 0.175 cent to settle at 149.200 cents per pound while September feeders fell 1.675 cents at 147.475 cents. After the close, the U.S. Department of Agriculture said cattle placements in April totaled 1.742 million head, or 108 percent of the same month in 2017. That was above analyst estimates for 1.717 million or 106.3 percent of a year ago. The figures were seen as neutral to bearish for live cattle futures on Monday, one trader said. CME lean hog futures closed higher, rebounding from a two-week low in the October contract, on short-covering and optimism about trade talks with Mexico, a major buyer of U.S. pork. Most-active CME October lean hog futures settled up 0.600 cent at 51.775 cents per pound and December rose 0.350 cent at 51.225 cents. Mexico has come “very far” in working through its list of outstanding issues with the United States in the renegotiation of the North American Free Trade Agreement (NAFTA), Mexican Economy Minister Ildefonso Guajardo said. Guajardo said officials from the United States and Mexico would keep working through the weekend to try to reach a deal on bilateral issues relating to the NAFTA renegotiation. Traders were also monitoring China’s battle to control the rapid spread of deadly African swine fever (ASF) across the world’s largest hog herd after four outbreaks in three weeks.